P2	P6	P11 What are Natural Resource Charter precepts? A particularly critical area for transparency is the sale of petroleum by national companies on behalf of the state. Disclosure should cover the amount of oil the company receives, and the price, grade, volume and date at which it is sold. 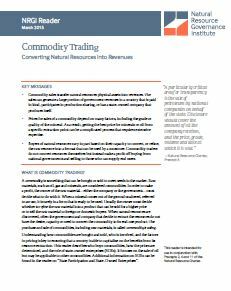 Commodity sales transfer natural resources physical assets into revenues. The sales can generate a large portion of government revenues in a country that is paid in kind, participates in production sharing, or has a state-owned company that produces itself. Prices for sales of a commodity depend on many factors, including the grade or quality of the mineral. As a result, getting the best price for minerals or oil from a specific extraction point can be a complicated process that requires extensive expertise. Buyers of natural resources vary in part based on their capacity to convert, or refine, the raw resource into a format that can be used by a consumer. Commodity traders do not convert resources themselves but instead make a profit off buying from national governments and selling to those who can supply end users.